I feel oddly conflicted about Going Over. Kephart's writing is, as always, a thing of beauty. From her vivid descriptions to her short, succinct phrases which convey emotion so artfully, the prose of this novel is to be marveled. Moreover, its subject matter - the tumultuous time period during which the Berlin Wall separated families and lovers in East and West Germany - has dutifully been researched, making this a novel which unabashedly immerses its readers into this era. 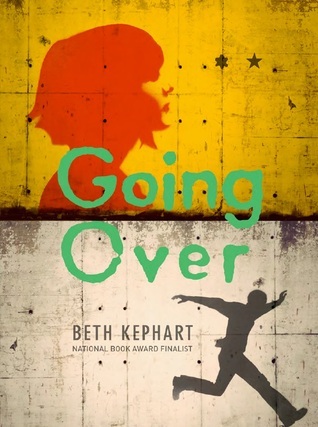 Kephart writes of two young lovers, but even more than their tragic romance, she writes of their growth; of their relationship with family and friends, of their delicate dreams in a time period of suffering, and of their unrelentless hope for a future which seems so far away. Nevertheless, that being said, I felt equally connected and distanced from certain aspects of this story. Going Over is told primarily from the Ada's point of view, a young teenage girl who dearly misses her boyfriend stuck on the other side of the wall. In fact, it is Ada's perspective which brought this time period to life for me, particularly the entire story line concerning a young boy she looks after in day care. It is written with poise and flavor, fleshing out these complex relationships and managed to resonate deeply with me. On the other hand, though, the perspective of Stefan, her boyfriend who lives on the wrong side of the Berlin Wall, fell flat. It was told in second perspective, which felt unnecessary, and the love story within these pages didn't completely win me over as a result. While the romance is not the central point of the novel, it is a driving force of agency between these characters, dictating much of their actions and shaping their personalities. As a result, to feel indifferent towards it did me no favors. Moreover, the crux of this novel lies in the fact that Stefan and Ada are separated. Ada is constantly convincing Stefan to take the risk, jump the wall, and live with her. It's dangerous and Stefan shares many reservations about this, which makes up the main story line of this book. Interspersed are other plot threads, all relevant to the time period, but this main arc didn't strike completely true with me. Mostly because the tipping point that launches Stefan into finally jumping the wall for Ada rang false, not selling me on this epic love story in the least. Aww, sorry it didn't work for you, Keertana. I couldn't bring myself to finish this book. I've had very little luck with Kephart's books. Although, the plot of Small damages was lackadaisical, I could get along the story, while Going over had some confusing parts and Ada's character was exasperating. However, I'm thinking of giving Kephart's book another chance before giving up. I've wanted to read Small Damages for some time, and the fact that this is by the same author immediately made me add it to my tbr-list. It's a shame Stefan let the story down, but Ada, and the historical aspect, really appeal to me! I have never heard of his author but this book sounds pretty neat. I think I should give it a try, too. Thanks for introducing me to it. Great review! Keep writing! I almost always struggle with second person Keertana, it just reminds me that I'm reading a story rather than allowing me to fall into the events and feel as though I'm sharing them with the characters. It's too bad this one didn't quite live up to the previous book you'd read by her, but her writing does sound gorgeous:) Lovely review! I'm not sure I like that cover—it looks very old, and not in a nice, vintage way. I have yet to read a story narrated in second person, but I'm intrigued by this, nonetheless. Great review, Keertana! I hadn't actually heard of this one until now but I am intrigued by the idea of it taking place during the time period of the Berlin War. I haven't seen many (any) books written that take place in Germany during that time period so I am curious. I am sorry that some of the aspects didn't work for you especially since you loved the author's previous book (which I should check out as well). Too bad this one didn't work for you. I can see why. It does sound like it was full of promise. I'm still curious about the author's writing, but I don't think I will start with this one. Oh I'm sorry that you didn't end up enjoying this story as much as you'd hoped Keertana, I know that you really enjoyed Kephart's book Small Damages and so was expecting a moving sort of read from this book too. But I do appreciate it when at least one pov works for you and I think I could still enjoy this because of Ada. I have this book coming up pretty soon, but your review has also reminded me that I need to get to Small Damages asap too! Lovely review! Sorry you didn't enjoy this as much as the authors previous work. When books are written in dual perspective I think they should be told in the same point of view to help unify things. Thanks for sharing your honest thoughts! I haven't read this book yet, and so I'm going to hold off reading your review as of now. I'll definitely visit it on GR though. I did see your rating, which makes me sad :(. I hope I like this one more! But glad it wasn't a total dud for you. Hm, I don't know... It sound interesting, but I'm not sure about reading this one. aww sorry to hear this one fell flat for you, I never heard of it before today so I will keep an eye out on it.